Enjoy Talk Like a Pirate Day with a New Pirates of the Caribbean 5 Photo! 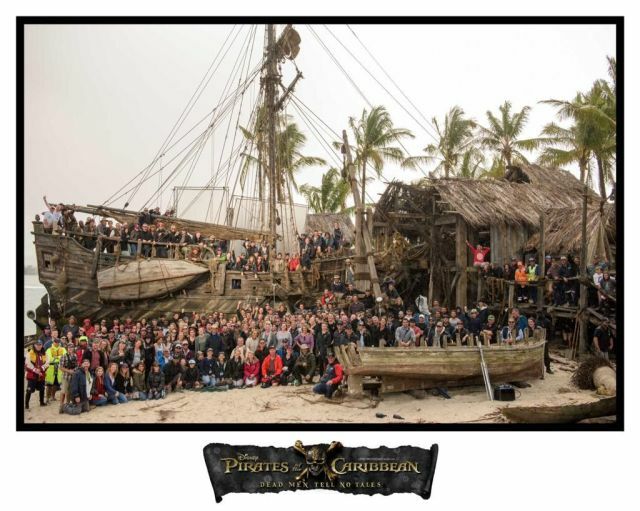 You didn’t think they’d let “Talk Like a Pirate Day” pass by without a little something from the set of Pirates of the Caribbean: Dead Men Tell No Tales did you? 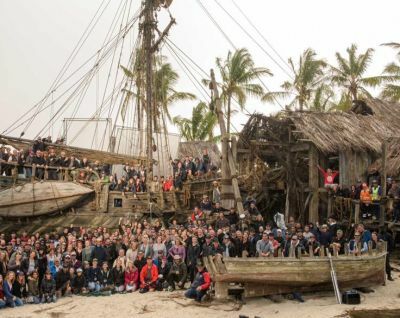 Producer Jerry Bruckheimer revealed a full cast and crew photo from the fifth film’s set to mark the occasion. Check out the Pirates of the Caribbean: Dead Men Tell No Tales photo below! Pirates of the Caribbean: Dead Men Tell No Tales begins as Captain Jack Sparrow finds the winds of ill-fortune blowing even more strongly when deadly ghost pirates led by his old nemesis, the terrifying Captain Salazar (Javier Bardem), escape from the Devil’s Triangle, determined to kill every pirate at sea…including him. Captain Jack’s only hope of survival lies in seeking out the legendary Trident of Poseidon, a powerful artifact that bestows upon its possessor total control over the seas. Directed by Norwegian filmmakers Espen Sandberg and Joachim Rønning (Kon-Tiki), Pirates of the Caribbean: Dead Men Tell No Tales will, as previously announced, feature the return of Johnny Depp as Captain Jack Sparrow, Orlando Bloom as Will Turner and Geoffrey Rush as Captain Barbosa. They’re joined by Academy Award winner Javier Bardem, who plays the central antagonist, Captain Salazar. The Maze Runner star Kaya Scodelario will also appear, playing an astronomer named Carina who is also in search of the trident of Poseidon. Brenton Thwaites (Maleficent, The Giver) also plays another new character named Henry.